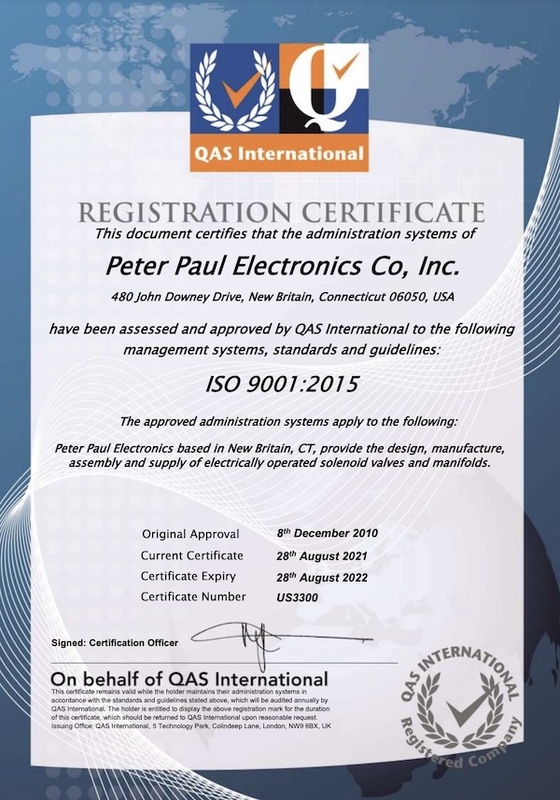 Peter Paul Electronics Co., Inc. is proud to announce ISO 9001 certification. PeterPaul started formally implementing ISO 9001 Certification in Y2005. Over a 5-1/2 year span, the companies operating processes were documented, and modified where necessary, to not only comply with ISO 9001 certification requirements, but to establish a robust Quality Management System (QMS). Importance was placed on efficiency and effective quality management system rather than have a certificate on the wall, so seeking ISO 9001 certification was secondary. The PeterPaul senior management team and the Mangiafico family supported the effort over the five and a half years. Review of the QMS was also integrated into company strategic planning and the progress reviewed. The training and education piece is important to achieve buy-in of all team members. A training presentation will now become part of the new employee orientation process. Training and training effectiveness are two key components that will be audited on each year. PeterPaul is in the process of developing an annual training plan plant-wide. Approximately 25% of the employee population has been at the company in excess of ten years. To learn new tools and make significant changes to how tenured employees approach their work is commendable. And happily employees are actually more satisfied since this effort. PeterPaul not only monitors internal metrics, but maintains a very comprehensive data driven process for analyzing customer returns to provide further process and product improvements. Suppliers are also monitored for performance in Quality, On-time Delivery and Responsiveness to PeterPaul needs.